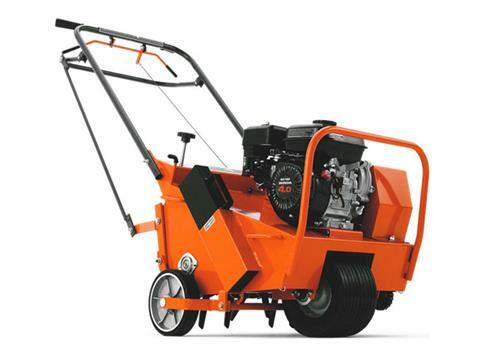 FREE-WHEEL DESIGN: The unique patented free-wheeling outer tines allow users to continue aerating without losing speed on tight corners and without damaging turf. COMPACT DESIGN: The compact design allows for convenient operation. REAR-WHEEL CONTROL: Rear-wheel control, allowing adjustment of working depth and settings for maximum stability. DETACHABLE WEIGHTS: Additional side weights allow for improved ground penetration and are removable for reduced effort when lifting or for altering weight balance on slopes and inclines. Length With handle folded - 39.5 in. Height With handle folded - 37 in. Width With handle folded - 29.75 in. Fuel Tank Capacity 0.53 gal. Oil Capacity 20.2 fl. oz. Aerating pattern - 3.8 - 4.2 in.